It’s time for Super Bowl commercials, and here’s the new one from Mountain Dew featuring Dale Earnhardt Jr. The Super Bowl commercial blitz is officially underway with the unveiling of a 60-second online teaser video from Taco Bell, found above. This minute-long production is a preview of the company’s new Super Bowl commercial, a LIVE MÁS® brand commercial called “Viva Young,” set to debut during the third quarter of the game February 3 on CBS. The full commercial, which will show that anyone at any age can “live más,” will be set to the music of Taco Bell Feed the Beat® artist and six-time GRAMMY® Award nominee fun.’s “We Are Young,” which will be sung in Spanish. Check out the teaser above and be sure to keep your eyes open during the third quarter of the big game next week! The wait is over. The bold new face of Lexus is here, and it cannot be contained. Watch Lexus’ first-ever Super Bowl commercial, introducing the all-new 2013 GS and a glimpse of what Lexus has in store for 2012. The 30-second commercial features the 2013 GS as it breaks free from containment, illustrating the company’s move in a new design direction for the brand. The spot also hints at the additional new vehicles Lexus will unveil later in the year, which are waiting in the wings for their turn to burst onto the scene. The 30-second commercial is scheduled to air at the end of the first quarter of Super Bowl XLVI. An early look at the commercial can be seen today on Lexus social media channels, including Facebook and YouTube. 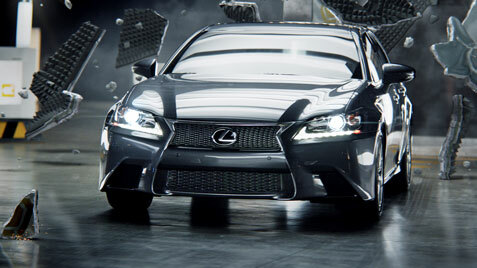 The new GS series will be a touchdown for Lexus and this very cool Super Bowl ad is a great way to start things up!